Indigenous Canadians have been described as “ghosts of history.” To a great extent, they have been ignored, even though Canadians are fully aware that indigenous people were here long before Europeans. Canadians know that indigenous people have been mistreated – their lands and culture stripped away through questionable means, leaving generations traumatized. But for many Canadians, ignorance is bliss – it’s easier to ignore this unpleasant chapter in history and pretend that the displacement, oppression and trauma of indigenous people never happened. The eclipse of the indigenous people by English and French settlers by the time of Confederation has left present day Canada floundering with its identity – and even affects us on the world stage. Canada’s attempts to be a global champion of human rights are often ridiculed as the result of its treatment of its indigenous population. A 2014 United Nations report showed that of the bottom 100 communities in Canada on the Community Well-Being Index, 96 were indigenous communities. In 2015, the Conference Board of Canada ranked 117 health regions in Canada and found that indigenous communities were at the bottom, mostly affected by social problems affecting health. That’s the impact of systematically undervaluing a whole group of people. That’s trauma in real life. 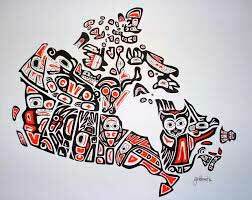 But history also shows us how important indigenous people were to the founding of Canada. Philosopher and writer John Ralston Saul argues that Canadian identity extends beyond the French and English and actually rests on a triangular foundation that includes indigenous peoples. Early exploration and settlement by the French and English would not have been possible without the assistance of indigenous people. Solutions and newfound pride in the Canadian identity can be found by looking honestly and responding appropriately to the lessons of history. The social problems facing many indigenous people because of intergenerational trauma are large. But the indigenous population is the youngest demographic group in Canada. That means we can support change in a large generation of young people that could cascade forward into generations to come. If we ignore the problems, the trauma will grow exponentially. If we address the problems, the healing will grow exponentially. Many come under the reconsideration of treaties. Rather than keep our treaties hidden under a cloak of shame, we should acknowledge and celebrate them with pride by focusing and emphasizing their original intent: an agreement between peoples about the peaceful sharing of lands in exchange for security from hunger, disease and obsolescence. Indigenous people should not be written off derisively as a stone-age people who couldn’t develop the wheel, as opined by Conrad Black and others. In fact, Canada is criss-crossed by rivers and lakes that were in summer traversed by light, efficient birch bark canoes by indigenous people and by voyageurs after Europeans arrived. In winter, snowshoes and toboggans were the only modes of transport over the deep snow. The wheel was useless during this period. Valuing indigenous people also means that we are compelled to help them. Only a handful of reserves, the lucky few adjacent to mainstream markets, have reached standards equivalent to the rest of society. Canada needs to pay attention to the Shamattawas and Attawapiskats of this country, which are plagued by suicides, drugs and alcohol, among other issues. Forced relocation is not an option, although valuing people by enabling them to relocate if they want to, with government assistance, should be available. Economic corridors linking isolated communities to the nearest regional centres need to be negotiated because jobs are lifelines to human purpose. Any new resource developments in these areas must include some ownership by the communities. Most importantly, treaty rights need to be portable, no longer used to restrict and confine indigenous people within the boundaries of their designated reserves. These are only starting points. But indigenous people need to be recognized as a people who once had independence, territory, communities, governance, trade, culture, traditions and spirituality. Rather than focusing on the shameful outcomes, recognizing and acting upon the original intentions of treaties will go a long way toward restoring pride, respect and dignity to indigenous peoples. We can help indigenous peoples assume their rightful place as one of the three pillars in Canada’s foundation. Together we can bring indigenous people out of the shadows – they will cease to be ghosts of history and can assume their rightful place as valued citizens of Canada. This article was based on a keynote speech delivered by Len Flett at the Indigenous Healing and Trauma conference in Calgary. — Leonard G. Flett is the author of From the Barren Lands and a member of the Kitchenuhmaykoosib Inninuwug First Nation (Big Trout Lake, Ont.). He is former vice-president of The North West Company, former chair of IndSpire, member of the Order of Canada and member of the Order of Manitoba. Nicole Letourneau is the author of Scientific Parenting and a professor at the University of Calgary’s Owerko Centre focused on children’s neurodevelopment. They are both expert advisors with EvidenceNetwork.ca.